I’m sorry I haven’t posted here more regularly of late, but it’s been busy around here. Real busy. In recent weeks my time has been monopolized by the latest edition of Lone Pine in the Movies, an annual magazine I produce for the Lone Pine Film Festival. As some of you know, I’ve been an active participant in the Film Festival for many years — two full decades, in fact. The organizers have often called upon me to secure prints of rare movies shot in Lone Pine, and for the last six or seven years I’ve been moderating most of the celebrity panels and conducting one-on-one interviews with special guest stars. This year my chores will include interviewing actor Don Murray, whose notable films include Bus Stop (in which he played opposite Marilyn Monroe), The Bachelor Party, The Hoodlum Priest, and Advise and Consent, among many others. Of course, honorees at the Lone Pine Film Festival are always quizzed about the movies they made in that rugged high-desert country at the base of the Sierra Nevada mountains. So I’ll also be grilling Murray about one of his earliest star vehicles, From Hell to Texas (1958), an exceptionally fine Western directed by the great Henry Hathaway. 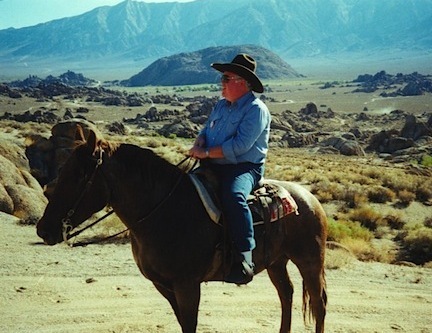 "Hopalong" Hulse in Lone Pine's Alabama Hills at the base of Mt. Whitney. 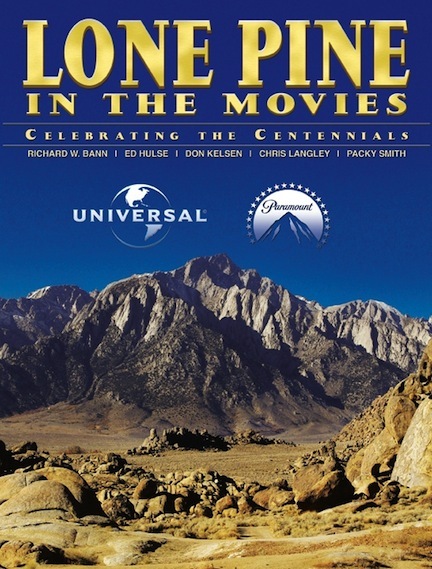 Each issue of Lone Pine in the Movies revolves around the theme of that year’s Festival. In 2012 we celebrate the centennials of Universal and Paramount, so the articles cover motion pictures shot in the area by those two studios. As it turns out, the earliest extant Lone Pine film is a 1920 Paramount silent, The Round Up, which we’ll be screening at the Festival with live musical accompaniment. I’ve seen it before but am eager to get another look. Having spent a lot of time riding through the picturesque Alabama Hills where so many classic chase scenes were filmed, I can now recognize and revisit many of the spots seen in these old movies. In fact, that’s now a big part of my fun every year. I’ll be leaving for California early next month but have lots to do before I go, not the least of which is finish work on The Best of Blood ‘n’ Thunder: Volume Two and the fourth book in Murania’s Classic Pulp Reprints series, H. Bedford-Jones’s 1916 historical novel, The Wilderness Trail. Also, I have several blog entries ready for posting before I leave town. Tomorrow’s: a look at the first issue of Popular Publications’ long-running pulp, Dime Detective. Have a great trip, Ed…hope to see you in Bordentown! Happy New Year and many thanks for all the info on Lone Pine.